When we had planned the first full day of our West Coast travel, we were at our home in mostly flat coastal Mississippi. There is a huge difference in the number of miles that constitute a leisurely day’s drive in Mississippi in contrast with a day of driving and sightseeing in the mountainous terrain we were encountering in northern California and Oregon. Husband Walter and I always seem to underestimate both drive time and the time we like to spend in spontaneous stops along the way in western states. Even though we enjoyed our long day and the new sights and experiences, we arrived at 10 p.m. at our bed and breakfast for the night – exhausted. Hubby just informed me we arrived at 8 p.m. It felt like 10 p.m. or later to me. 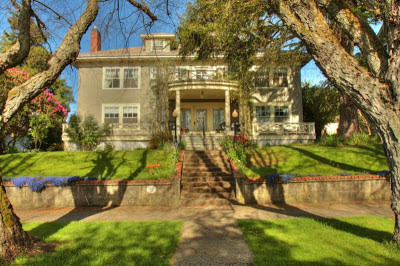 The home’s lived-in history offered welcoming comfort, and our brief stay at Coos Bay Manor in the coastal town of Coos Bay, Oregon, proved to be restorative. Friendly innkeepers-owners Dave and Madge greeted us Sunday night with a warm welcome. The luxurious bed in our spacious second-floor room was not only picturesque, it also enveloped us in comfort. We awoke the next morning refreshed and reinvigorated. Hubby straightened the bed linens for the morning photo above. But I am sure if Madge should see the photo she would be itching to return the pillows to her original artful order. We started our day with pots of hot tea and coffee left conveniently outside our door with perfect timing. I felt like a queen in the comfy antique chair. I pulled up the upholstered footstool that Madge had placed by my side of the bed the night before to help me negotiate the climb into bed. It was also perfect for propping my feet as I enjoyed my wake-up cups of a delicious brew. It was our first stay in a B and B, and our experience was off to a superlative start. Thanks to the tea and coffee, we were ready for pre-breakfast exploration. Hubby and I were the only guests on this low-season, weekday morning, and with our cameras in hand, we ambled around the historic home. It was built in the late 19th century, and retains many of the original fixtures and architectural details intact. 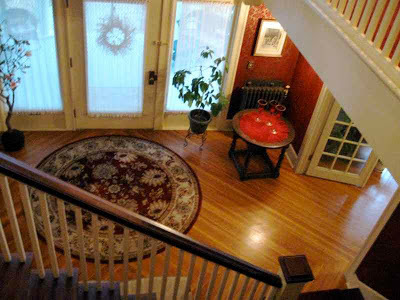 The second floor open hallway overlooked the entry and gave a grand sense of spaciousness. The owners and their son and his wife make the third floor of the manor their home. 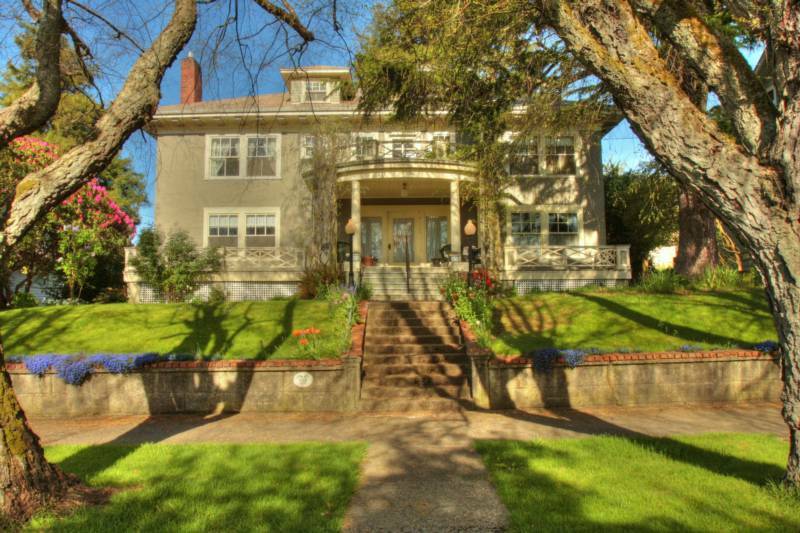 They all have a hand in running Coos Bay Manor, as well as pursuing other professional and creative interests. There was no slick, cookie cutter décor. Age and evidence of real life and use created an inviting sense of home. The radiators, for example, were ornate in the public areas and less decorated in the behind-the-scenes rooms. 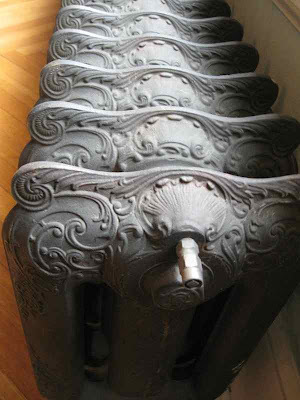 They are original to the house and continue to provide the home’s heat through circulation of heated water. The only modern difference is the fuel source for heating the water. 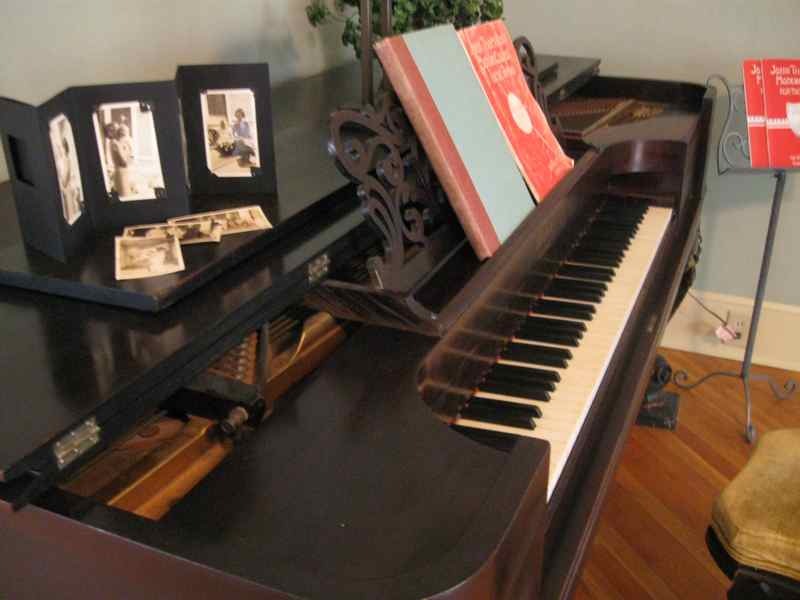 A piano in the parlor appears ready for a musical evening. The front porch invites lingering for fresh air and conversation. The dining room was flooded with natural light through tall windows. The tables, table settings and serving items fit the period with elegance and efficiency. Breakfast was delicious and spiced by conversation with Madge about her home’s history and her family’s experiences as newly minted innkeepers. Thank you, Hubby, for this surprise treat. And thank you, Dave and Madge Osborn, for your gracious hospitality. 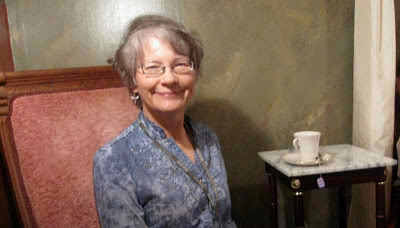 The photos of Coos Bay Manor and Dave and Madge are borrowed from the Coos Bay Manor Website. Husband Walter posted photos and a synopsis here of our eight nights of lodging experiences. 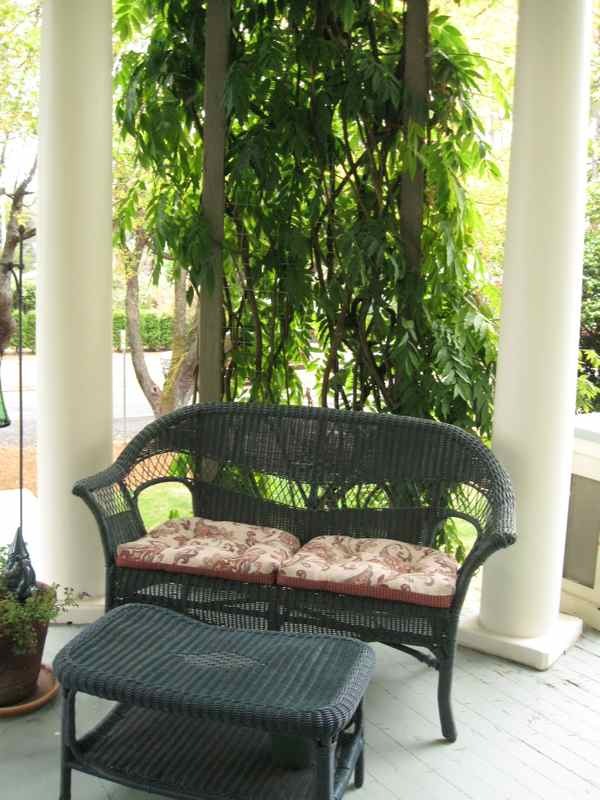 This looks like the perfect spot to spend the night if one needs some R & R. I love B & B's. Jim and I enjoy them tremendously. This one is wonderful! Thank that sweet hubby of yours for giving you this great surprise. That is a truly beautiful place. I can imagine how comfortable it would be to spend time there. I know what you mean about estimating our travel time. I tend to do that, unless I'm on a mission to just get there, no sightseeing or unnecessary stops. And that's not a fun way to travel. I'm glad you had such a wonderful place to rest afterward! Very clever of you to take shots of the interior of the various B&Bs where you have visited. David and I have stayed at a number of B&Bs and although I took exterior shots, I did not take a single shot of the interior. Thinking back on it I realize the owners probably would not have minded as its free publicity. i have never stayed in a b and b and have always thought it would be fun. this one is beautiful, inside and out. love the piano and the radiator and the bed is great, he did really good fixing it up. 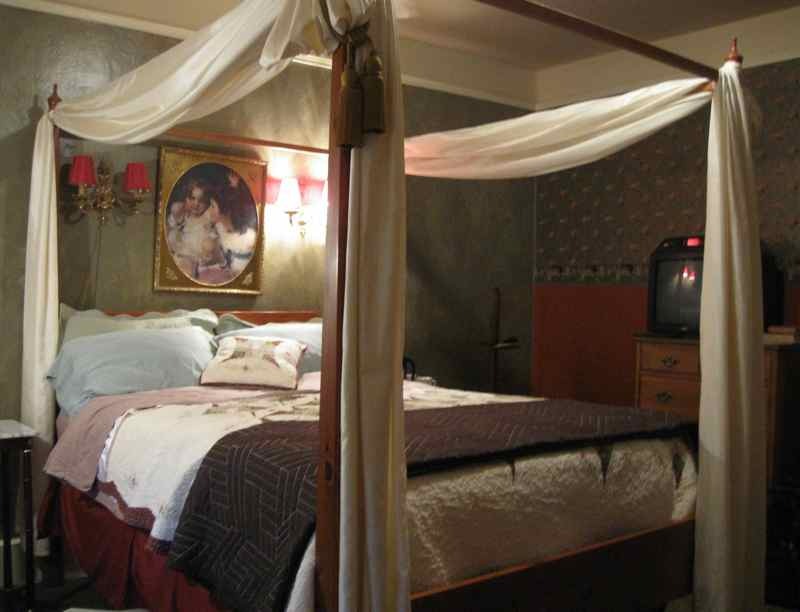 forget the artful pillow thing just look at that bed. #1...You have one Honey of a Husband. What a wonderful trip and so many interesting places to visit. The B&B looks delightful. I have stayed at a few and find them so quaint and like a step back in time. I'm so glad you want to still travel and yes traveling in California and Oregon takes much longer than where you live. Mountain winding roads can be a challenge. I've always been intrigued by B&B's, but have never had the opportunity to stay in one. Thanks for sharing your experience. It's a beautiful house! Just thought I'd try to answer you as to what a Papple tree is. This was the name we were told when we moved into our house 5 years ago. The apples look like Asian Apples or Asian Pears and have the texture between an apple and a pear. It actually is a sort of strange flavor but it has grown on me. I don't really know how to take care of it but I do believe this year it is showing its split personality.